We did venture out once or twice from our compound to mixed results. 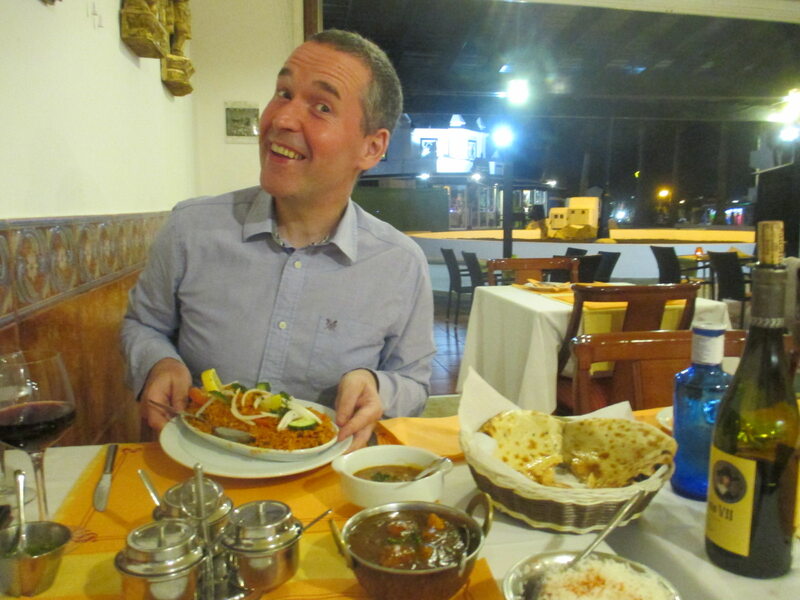 Here's me in local Indian 'Spicy Affair'. 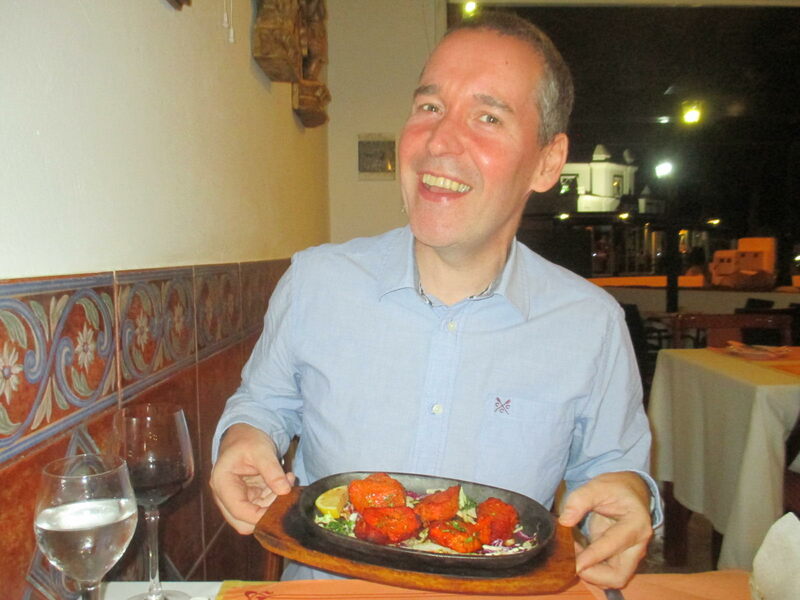 Sadly the promised affair was barely a peck on the cheek, This chicken tikka was OK but not char-grilled or spicy enough for my liking and there was no oniony base to speak of. The main course (well done Wife on the wide angled shot) was disappointing. I went for the lamb bhuna and sadly it could have qualified as a vegetarian offering. You'd get more lamb on Larry's pecker! The rice, onions and base sauce were fine but a couple of chewy, microscopic bits of unidentifiable meat ain't gonna cut it. The peshwari nan was OK but I've had better but at leat the wine was good - a 3.2 on Vivino for about £10. 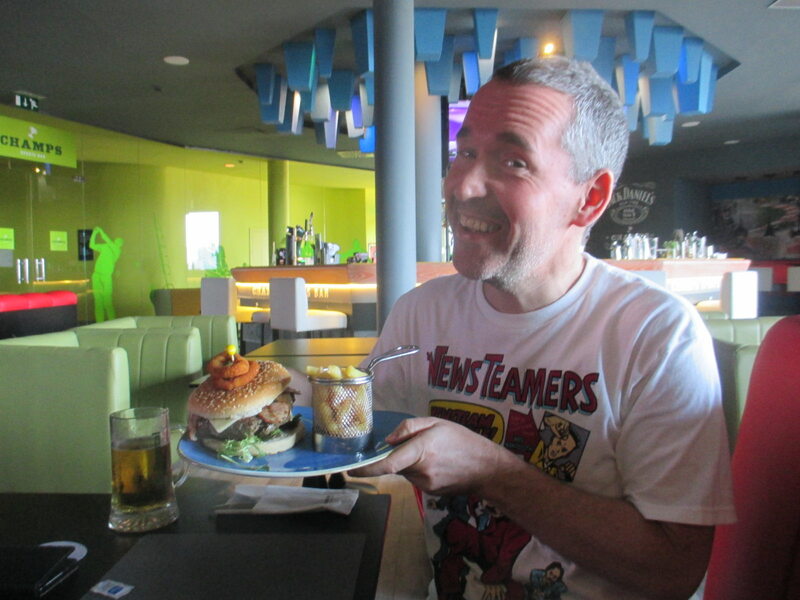 In the hotel sports bar again - well it was free. These ribs were immense practically a steak's worth of meat on each of the 3 doublers that comprised the portion. 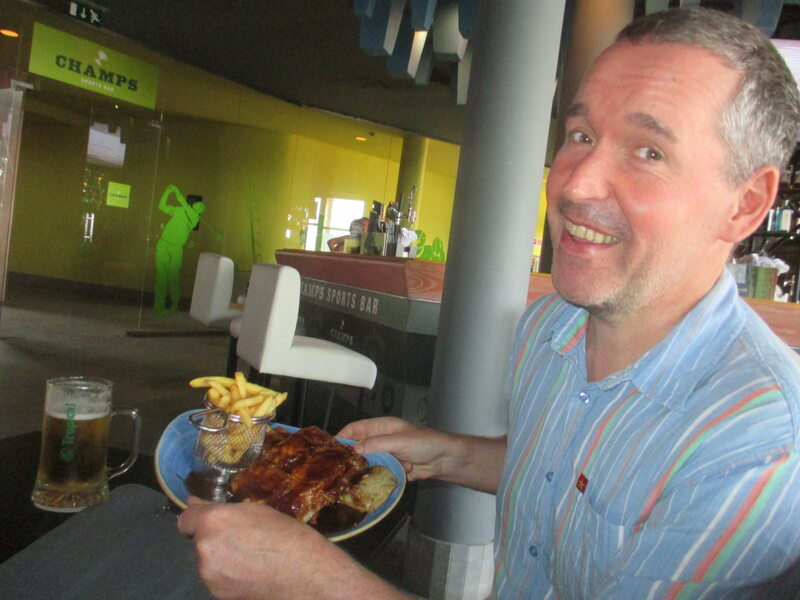 The skinny chips were a bit lost in the meat frenzy but I did like the ubiquitous Jack Daniels sauce. 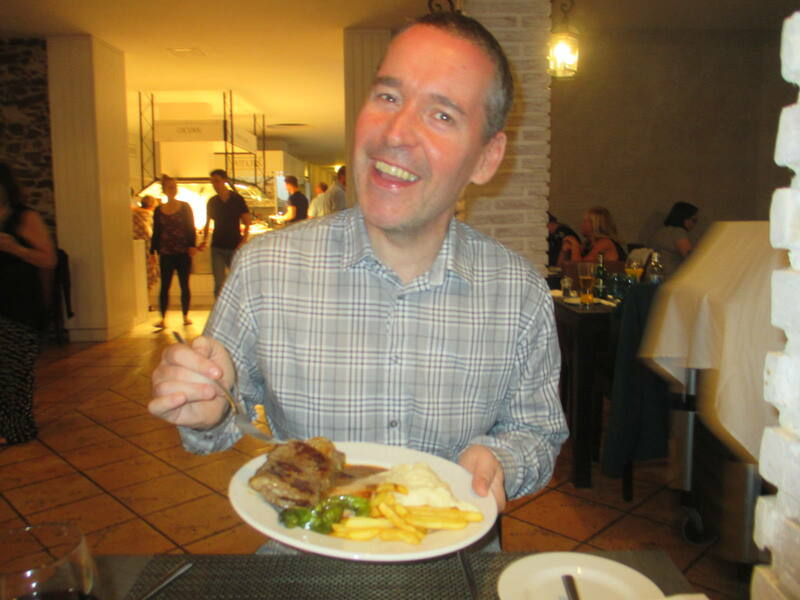 If that wasn't enough colon clogging here's me in the hotel dining room with a nice steak. It was probably a different night but Imigur is in charge of the photo ordering. I was a bit cautious going in but the meat was good quality and the lady cooking the steaks let you have a look at the innards before you claimed it so you had the desired level of bloodiness. I also have on my plate creamy mash, grilled chilies and chips as is required by Scottish law. Back at Champs for my only burger of the trip and it was a good one. Home made and very meaty. I had to abandon half the bun to make sure I kept up my meat quotient for the day. 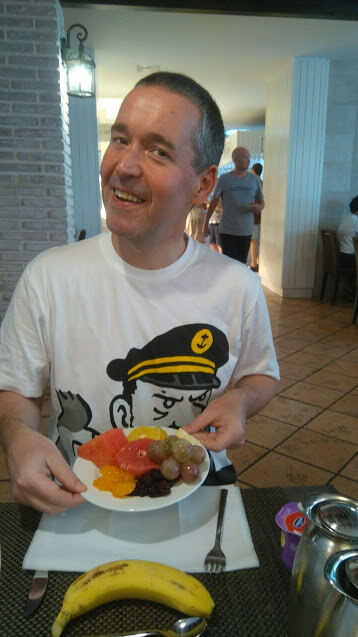 Here's another fruity breakfast with added yogurt and banana and a cameo from Michael Carroll in the background! Another lunch at Champs - we really should have gotten out more. 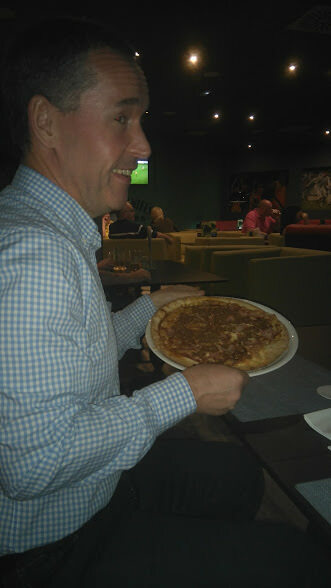 This pizza looks like a brown frisbee but was in fact a tasty barbecue and bacon number. Note the wife experimenting with different camera angles - she has been told! And one more Champs offering - to be fair to me I had something different every time, even when I found something I liked. 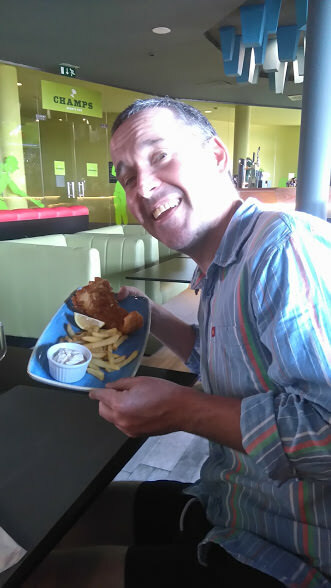 Case in point is this very nice fish and chips with home made chunky tartar sauce. Yum! Note the wife experimenting with different camera angles - she has been told! Okay, but please don't post those picture here. Little more than we can cope with. Wot no chips? as for your money back! Last two! Hurrah - til next time! 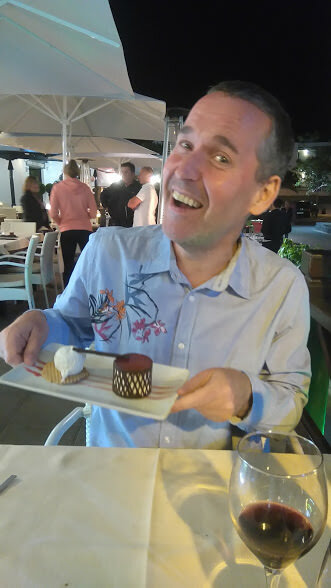 On this night we spent too long watching Only Connect (Rock n' roll all the way) and missed the dinner service so we had to venture out into the resort. 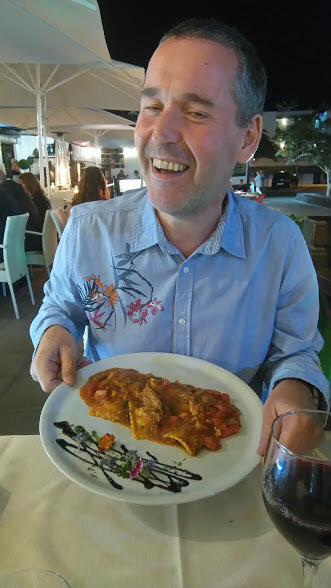 This was a nice Italian which was maybe a bit fancy for its clientele - well this well oiled guest at any rate. Like Reggie Perrin I always go or the ravioli. This was lovely but there wasn't that much of it and the individual ravioli were hard to separate from their brethren. See you for the Christmas special(s)! Lovely smear - I think that's the term - on your pudding plate!